The Clemex dry powder disperser, distributed by Particle & Surface Sciences Australia , is a software-controlled dispersion unit for dry powders. 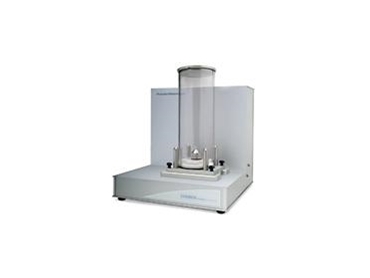 Addressing a need in the field of particle characterisation, the Clemex powder disperser breaks agglomerates, without damaging the particles, so that they might be easily observed and differentiated on glass slides for particle size and shape analysis by optical Microscopy. Users need to place the powder in the nozzle chamber and position two microscope glass slides in the holders. The computer interface allows the user to select pre-defined particle dispersion templates. By selecting one of these templates all the settings such as starting pressure, dispersion flow and time are already defined and allow users to start the dispersion process immediately. If more control is needed, the user can step in and create a particle dispersion template and save it. Once a powder disperser run is initiated, it takes between 1 to 4 minutes for particle dispersion to complete, depending on the starting pressure. The incoming air directed into the nozzle disperses particles into the dispersion chamber and they fall back onto the microscope glass slide. With its combination of hardware and software, the Clemex powder disperser produces uniform and repeatable deposits of particles on microscope slides. By using pre-defined templates the software allows the user to get repeatable dispersion results. Used in conjunction with the Clemex PSA300 workstation, it is an essential part of any laboratory conducting particle size analysis. Analysis is made easy and repeatable, and results can be validated since each particle is associated to its corresponding measurement. Other powder dispersers use compressed air which can often be contaminated by oil or humidity. By using a vacuum system the Clemex powder disperser introduces no contaminants into the air flow. While most dispersers use fluidised beds or high-pressure aerosol, the Clemex powder disperser uses vacuum, insuring that no particle is damaged or modified by the disperser’s environment. Specially designed nozzles combined with an elongated particle dispersion chamber allow the particles to move freely minimising collisions with the top of the chamber therefore obtaining undamaged particles. Dispersion chambers come in varying sizes in order to accommodate differences in particle weights. The Clemex powder dispersion system is mainly composed of a computer controlled vacuum unit, a selection of powder dispersion nozzles (with different dispersion patterns), a primary powder chamber, an elongated dispersion chamber and a twin-slide holder.